Hubby & I watched Marley and Me on the telly and I just had to read it right away. My granddaughter had forgotten her copy here so I read it and loved every page. I laughed, I cried..........quick read and I'm so glad that I did. This is the story of a yellow lab named Marley; supposedly the worst dog in the world. His family adores him but he has so much energy and is bursting with just the happiness of life that he simply cannot behave. A true story. A sweet story. A happy story. A sad story. With the film out, I thought should probably get around to reading the book; I also thought that the book couldn't possibly be as cute as the film. I was wrong - going on what I've seen in the trailer, there is absolutely no need for dramatic licence in telling Marley's story! From the opening chapter, John Grogan had me in fits of silent hysterical laughter, describing behaviour that I recognise from my own personal experience of labradors, not to mention Marley's own incredible adventures (including jumping out of the window of a moving car, and taking a restaurant table for a walk). Of course, I knew what was coming - family and friends who have read the book warn of the sad but inevitable conclusion - but I really wasn't prepared for how close I had grown to Marley throughout 250 pages of mayhem, and had to save the last few pages until I was alone. To say I cried is an understatement. Yet it is worth braving the tears, because the real belly laughs come as John Grogan recounts some of the horror stories he received in response to his farewell column for Marley - I was still half blind, sniffing and dabbing at my eyes with tissues, but now I couldn't breathe, either! 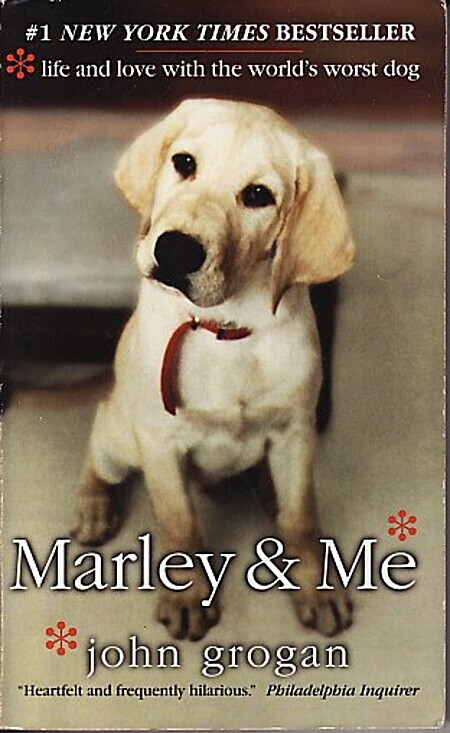 At the time I read this book I had a dog named Harley that reminded me a lot of Marley. That may be why I liked this book so much, or it could be the fact that I am an animal lover. Either way I loved this book. The story of the problems Mr. Grogan and his family had with Marley were all to real. Every pet owner has moments of distress where they feel that they could give up their pet, but love always wins. I think that the antics of Marley were greatly detailed. I laughed out loud, I cried...I loved this book! I've been recommending it to everyone I know. I put off reading this book for a long time, suspicious of the hype around the book and then, not long after, the movie. I needn't have worried so much. John Grogan has done for American dog lovers what Deric Longden did for British cat lovers. He has written a memoir with a deceptively simple premise - one man's story of life with 'the world's worst dog', his labrador retriever Marley. What actually leaps out of the story is a wonderful portrayal of family life with this huge personality in its midst, a heartwarming tale of one dog from bouncy puppy to geriatric old dog. There is enough humanity to keep the book grounded, enough Marley to fill the whole with boundless energy. It made me laugh out loud, it made me cry so much I had to do some serious mascara damage repair, it made me think, it made me smile... I'm definitely a cat person, but Marley's personality won me over from the word go, with his fierce loyalty and sheer enthusiasm for life. "Marley taught me about living each day with unbridled exuberance and joy, about seizing the moment and following your heart. He taught me to appreciate the simple things - a walk in the woods, a fresh snowfall, a nap in a shaft of winter sunlight. And as he grew old and achy, he taught me about optimism in the face of adversity. Mostly, he taught me about friendship and selflessness and, above all else, unwavering loyalty." Great book for anyone, especially if you have ever had a close pet family member...great story. If you've ever been owned by a dog, you will relate to this book. Marley was everyone's dog. I've had several Marleys'. Just be sure you have a tissue box handy for the last chapter. I loved this book. Being an animal lover and the owner of 3 dogs, I could connect with the behavior Marley exhibits(my dog would definitely have been kicked out of obedience school). I laughed out loud at parts and of course had to wipe away a few tears. Definitely would recommend to anyone, but especially any dog owners. I was never a dog-lover. After reading this book, I think I'm able to become one. Of course, I have to start with a really small dog. I don't want someone like Marley barreling into me the first time. Marley & Me is the tale of neurotic dog named Marley and his family the Grogans. The story starts when John and his wife Jenny bring home a 12 week old yellow lab who they name Marley. It soon becomes clear that Marley is no ordinary dog and is neurotic and loyal to a fault. This book focuses on the lighter side of Marley and even the darker issues that are dealt with.I laughed quite a bit especially when they took lovable Marley to the street cafe for a family afternoon out and the chaos that ensued. I held my breath as the family came close to giving him up, and teared up when Marley came to the end of his life. My only negative was that I was a little perplexed over their dismay over how Marley behaved, every Labrador I have ever know has been a little nuts or more accurately a huge powerful dog with the mental capacity of a puppy. This book is "light & fluffy" and does not deal with the more serious issues raised in depth which is understandable the book is not about that it is about Marley. An enjoyable read about Grogan, his family, and his loopy Lab Marley. As someone who shares a house with an aging, somewhat neurotic Shepherd-Lab-Who-Knows-What-Else Mutt, I could relate to Grogan's humorous tales of life with Marley. I’ve never read a book like Marley and Me. With crazy stories that cost the Grogans thousands of dollars, Marley’s one fear, and moments where John and Jenny Grogan have to stay strong, John Grogan makes sure Marley’s time in the world will never be forgotten. Throughout the book, John Grogan thoroughly describes key events in the 13 years he spent with Marley, his own life with Jenny, and their struggles with Marley and their children. It forces the reader to recall their own dog and compare their struggles to the Grogans’. My dog, a Black Labrador Retriever, died in 2008 as he approached his 10th or 11th year in life. He loved to chew and escape the house, a natural Houdini. After reading Marley and Me, I could no longer see him as a bad dog. He just had misbehaved. Marley, however, was a completely different story. he would eat jewelry, demolish a toy in seconds, and make decisions that led to a terrible outcome. Marley certainly was a handful! As the story progresses, it becomes more sad and depressing because the Grogan’s are facing what all dog owners must face:old age. Marley begins to have arthritic hips, worn-down teeth, and becomes deaf. It is very emotional and detailed. The way John Grogan wrote it made me want to cry. I did, eventually. He told almost every detail that mattered from Marley’s adoption into the Grogan family to the moment he died, as well as the following weeks after his death. The author wrote about Marley fondly, painting images of Marley beautifully with descriptions of everything during the event. What I think John Grogan did best while writing this book was he not once said “I remember” or “recall” or anything that made the reader feel like it was in past-tense. He wrote like it was taking place at that very moment, a story, not a memory. I absolutely loved this style; it got me more involved and into the memoir. There are many things that I wished had occurred in addition to the events, yet it is hard to criticize when what you are writing about is a memoir. You cannot control what is to happen or what the world looked like when it happened. You can control, however, HOW you describe it and WHAT you decide to set the tone to. In my opinion, these things are key to a memoir. You can write all you want about the event with a bored expression and with very little description and the memoir will come out boring to read. John Grogan successfully steered clear of these dangers, creating a book that is very elegantly written and an amazing and interesting read. I took this book one morning as I ran out of the apartment, for my usual train reading. It was so funny I burst out laughing by myself several times, drawing stares from the other passengers. During the office hours it was hard to keep from reaching out and read a few more pages. Six o’clock came and I heaved a sigh, starting to walk to the station with the book open in my hands. Alas, a senior colleague happened to ride the train as well, in the same carriage, and out of politeness I closed the book and paid attention to his conversation, all the time thinking, “Oh why, why, why of all this time he should be on my train today! I could have read a few more pages of the book!” However, later on after getting home and throwing myself on the sofa to continue reading I thanked heaven for sending that guy on the same train with me. It turned out that the next few pages were tear jerker. Imagine bawling my eyes out on the train? Yes, Marley and Me is such a book. John Grogan writes it with wittiness and slight cartoonish exaggeration it sends you to chuckle if not downright roaring laughter. He also writes it from such a depth of emotion that you sometimes need some tissues around to wipe the tears of your cheeks. Marley and Me is a biographical book telling the story of a huge Labrador retriever named Marley, and his family, which started with a pair of young couple John and Jenny, and as the years go by added with three children. Marley was not a perfect dog. On the contrary, he is, in Grogran’s words, a chewer of couches, slasher of screens and slinger of drool. Marley was not the smartest of dogs, he’s always hungry and loved to steal food. He crashed into things and was prone to mischief. He was once kicked out of obedience class. He was also neurotic and had a big phobia to storm, which would turn him into a home destroying machine. After a little more than a year of marriage, John and Jenny Grogan decided to get a dog as a pet. They had no children and thought having a dog would be a good way to practice their parenting skills. They decided to buy a somewhat goofy Labrador puppy they named Marley. Marley, while full of exuberance and love, turns out to be quite a handful with his fear of thunderstorms, love of jumping up on people, tearing the house apart, and habit of chasing any object that moves. "Marley and Me" is a loving tribute to Marley as it chronicles his thirteen years with the Grogan family. What I liked best about "Marley and Me" is that it's the story of an ordinary family and their love for each other and their dog. The book isn't just about Marley; it describes the Grogan's struggle to have a baby and Jenny's post-partum depression when she does conceive as well as other life changes such as new jobs and moves to different cities. But the book is mostly about Marley and he certainly is a handful. Readers may wince at some of his antics and the destruction he causes, especially with his intense fear of thunderstorms, which ironically was rationalized when he was actually caught outside in one. At times Marley seems almost human, especially when he comforts Jenny after her miscarriage. Grogan's attempts to train Marley are very humorous, such as when Marley fails obedience school and when he literally drags a table he is tied to across a restaurant. Other times his attempts seem almost cruel, like the way he gets Marley to stop jumping on people. While reading the book I sometimes wondered why the Grogans kept Marley, the list of items they left with a dog sitter to take care of Marley was incredibly long and scary. John Grogan is a newspaper columnist and a gifted writer who makes Marley come to life on each page - you can picture him during his various antics. Speaking of pictures, the book is full of pictures of Marley, John and Jenny, and their children. The pictures of Marley look like they were selected with care and often match the chapter heading. And yes, the ending is a bit sad, but uplifting all the same. I know EVERYone is reading this book right now, but that's because it's good! If you're an insane dog lover like I am, it's a must read. Funny, shocking, touching, sad. I found myself laughing and crying like an idiot on the train going to and from work. Great fun. Touching book about Marley and how he helps the family through many happy and sad times in life. The end of this book is so sad but definitely worth reading to remind me how pets serve a special purpose in everyones lives. Many times I was laughing out loud then later using many tissues! I'm usually very uncomfortable with generalizations, but in this case I feel very safe in saying that any dog-lover would enjoy this book. Grogan is a natural storyteller, and his anecdotes about the "world's worst dog" have a resonance that gets to the heart of what it's like to have such a companion. More than just a story about a goofy, possibly insane tank of a dog, Grogan really gets into the heart of what it means to have such a loyal companion. It's a story about unconditional love, friendship, and family. If this book was nothing more than a "our dog was bad but we loved him anyway" story, it would be a decent read, but nothing to get too excited about. It's more than that, though. It's almost like a novel more than a memoir--the "characters" are dynamic, and you really feel along with them. You realize how Marley helped them to grow, not only as a family but also as individuals, and when Grogan writes about how he realized it too, it hits home for someone who's felt the same way. A sweet and fluffy piece of sentimentality, this book loses stars for the shocking editing. Note to American editors: you do not "queue up" a movie - the word is cue! Similarly, you "acclimatise" to something, not "acclimate". You'd think that since the author is a journalist, these things might have been caught.